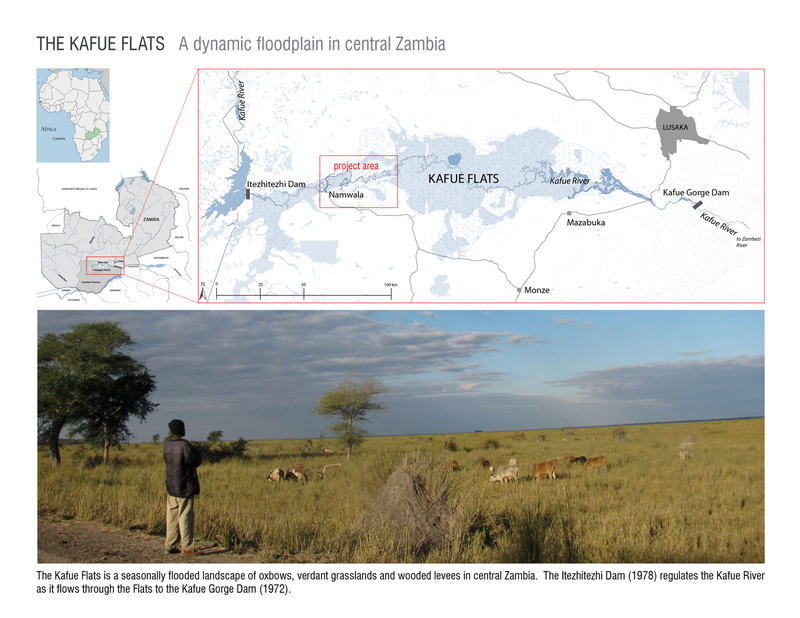 The Kafue Flats: A Dynamic Floodplain in Central Zambia. The Kafue Flats is a seasonally flooded landscape of oxbows, verdant grasslands and wooded levees in central Zambia. The Itezhitezhi Dam (1978) regulates the Kafue River as it flows through the Flats to the Kafue Gorge Dam (1972). 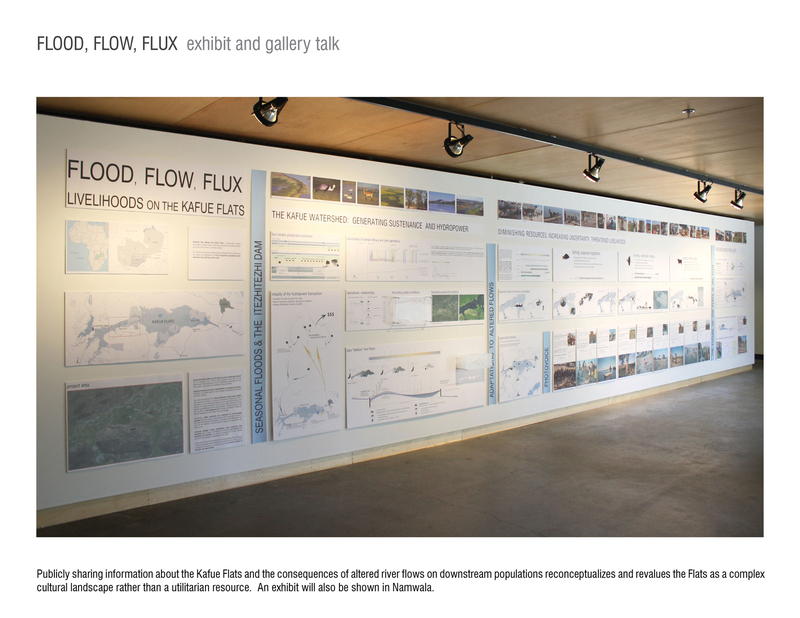 Flood, Flow, Flux: Exhibit and Gallery Talk. 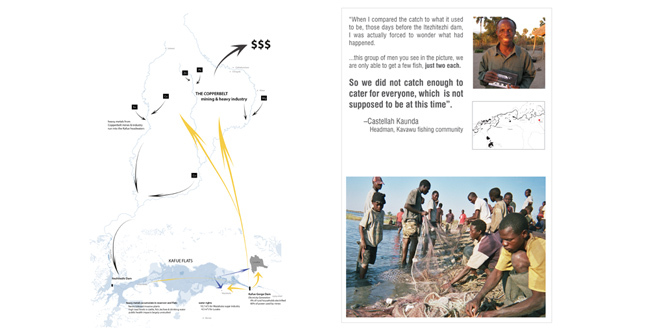 Publicly sharing information about the Kafue Flats and the consequences of altered river flows on downstream populations reconceptualizes and revalues the Flats as a complex cultural landscape rather than a utilitarian resource. An exhibit will also be shown in Namwala. 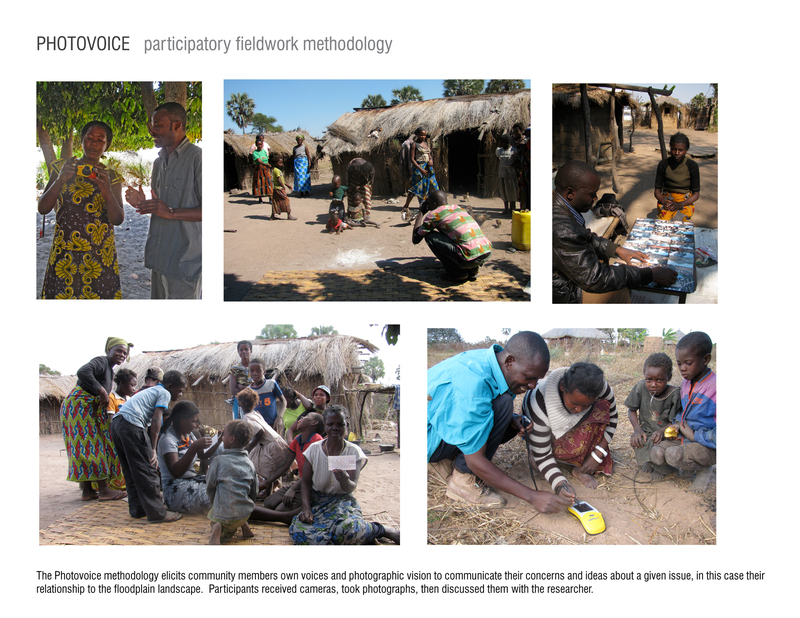 Photovoice: Participatory Fieldwork Methodology. 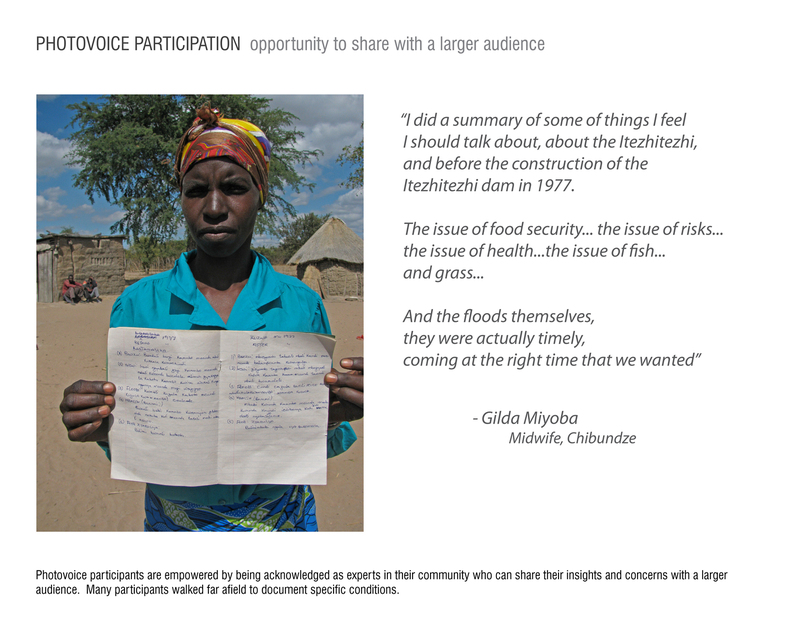 The Photovice methodology elicits community members own voices and photographic vision to communicate their concerns and ideas about a given issue, in this case their relationship to the floodplain landscape. Participants received cameras, took photographs, then discussed them with the researcher. Photovoice Participation: Opportunity to Share with a Large Audience. Photovoice participants are empowered by being acknowledged as experts in their community who can share their insights and concerns with a larger audience. Many participants walked far afield to document specific conditions. 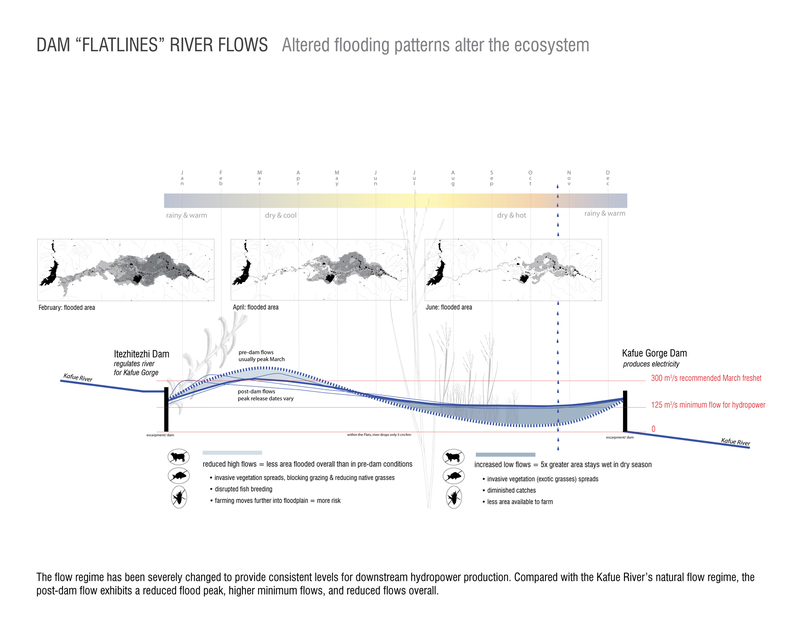 Dam "Flatlines" River Flows: Altered Flooding Patterns Alter the Ecosystem. The flow regime has been severely changed to provide consistent levels for downstream hydropower production. Compared with the Kafue River’s natural flow regime, the post-dam flow exhibits a reduced flood peak, higher minimum flows, and reduced flows overall. 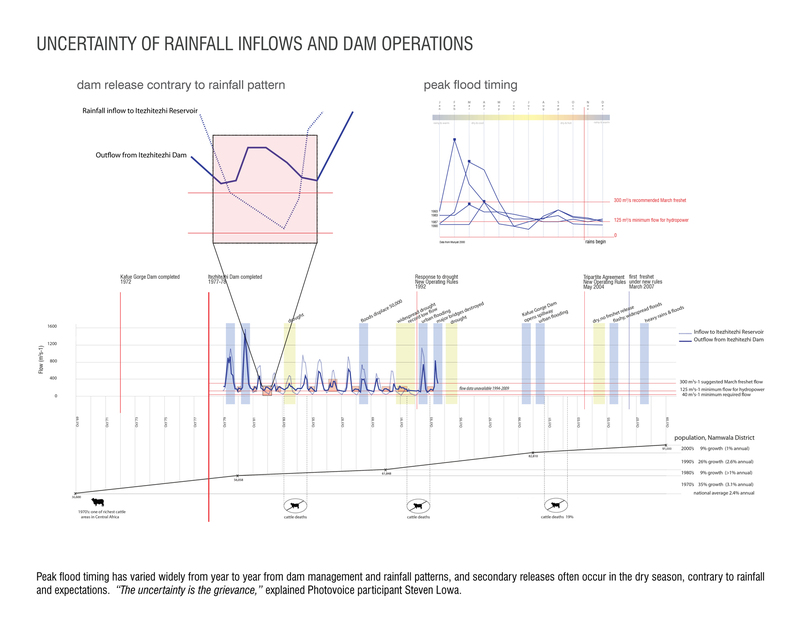 Uncertainty of Rainfall Inflows and Dam Operations. 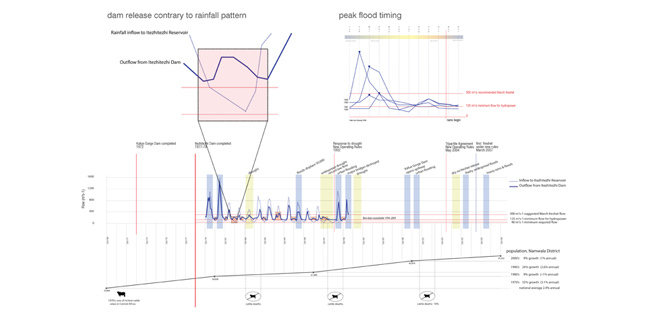 Peak flood timing has varied widely from year to year from dam management and rainfall patterns, and secondary releases often occur in the dry season, contrary to rainfall and expectations. “The uncertainty is the grievance,” explained Photovice participant Steven Lowa. 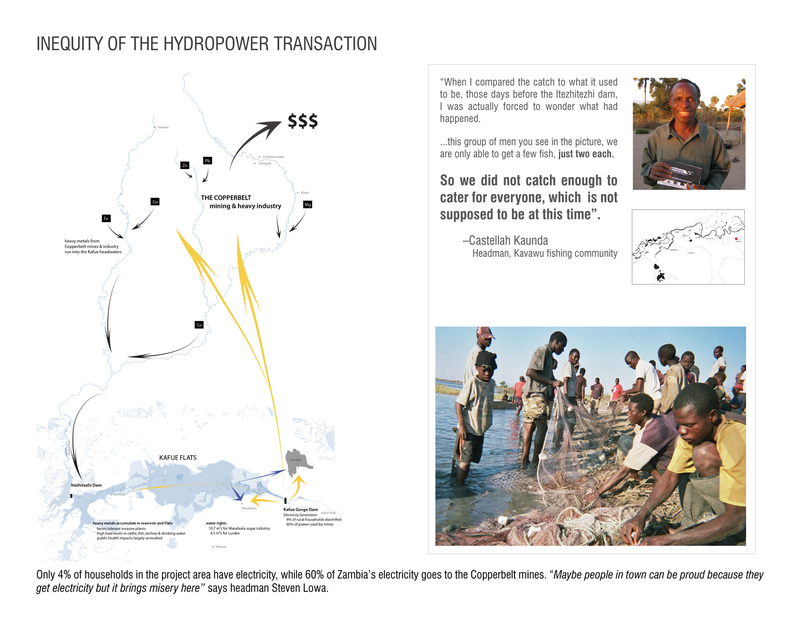 Inequity of the Hydropower Transaction. Only 4% of households in the project area have electricity, while 60% of Zambia’s electricity goes to the Copperbelt mines. “Maybe people in town can be proud because they get electricity but it brings misery here” says headman Steven Lowa. 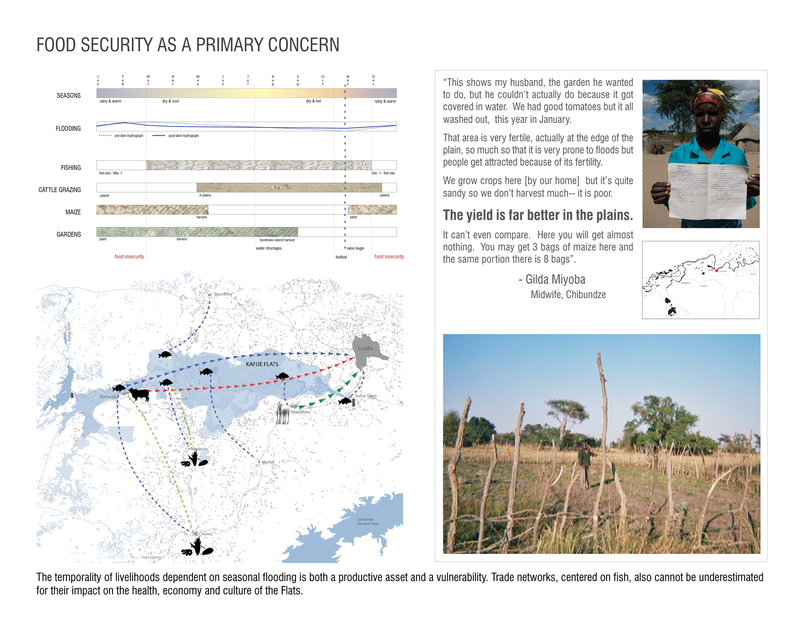 Food Security as a Primary Concern. 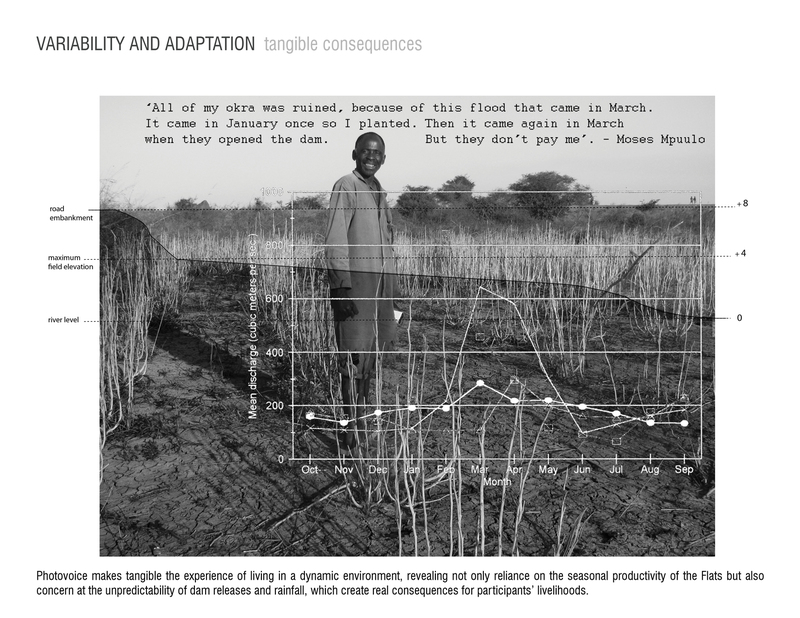 The temporality of livelihoods dependent on seasonal flooding is both a productive asset and a vulnerability. Trade networks, centered on fish, also cannot be underestimated for their impact on the health, economy and culture of the Flats. Seasonal Flux is Productive: Rich Ecotones Nourished by Flooding. The fishing, farming and cattle grazing livelihoods that characterize the region are dependent on a rich ecosystem nourished by the seasonal rise and flow of the river. 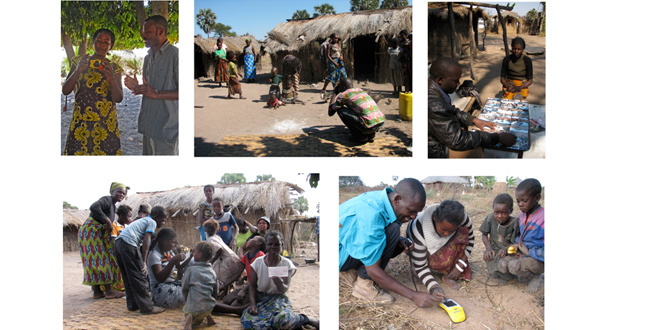 The productivity attracts a growing population from around Zambia and neighboring nations. 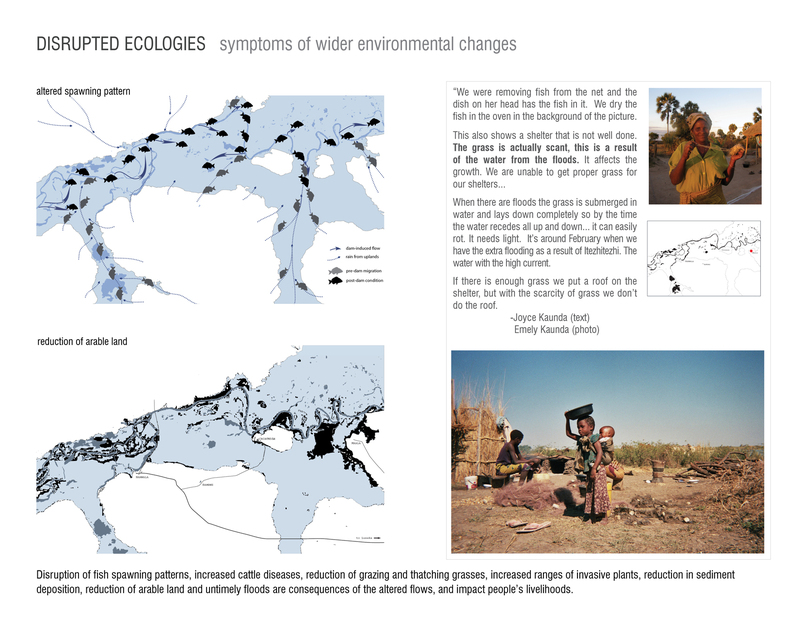 Disrupted Ecologies: Symptoms of Wider Environmental Changes. Disruption of fish spawning patterns, increased cattle diseases, reduction of grazing and thatching grasses, increased ranges of invasive plants, reduction in sediment deposition, reduction of arable land and untimely floods are consequences of the altered flows, and impact people’s livelihoods. 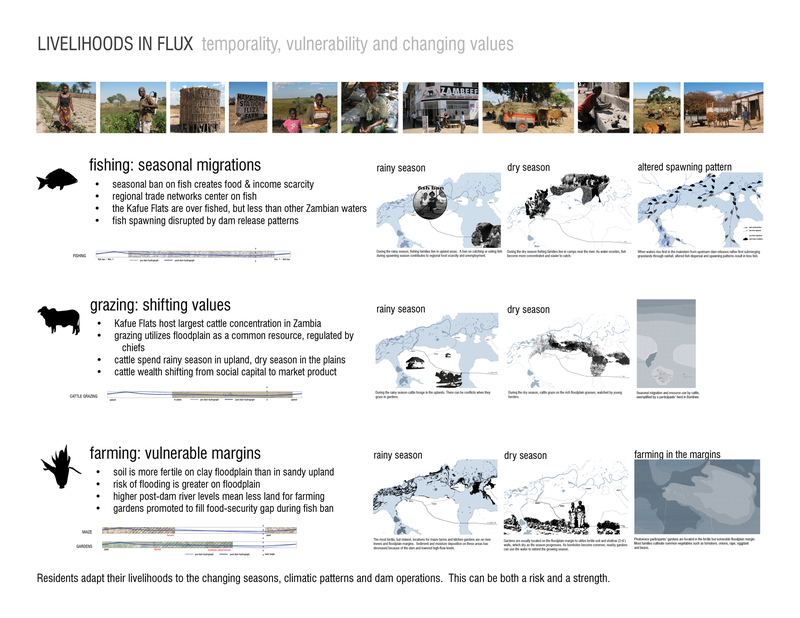 Livelihoods in Flux: Temporality, Vulnerability and Changing Values. 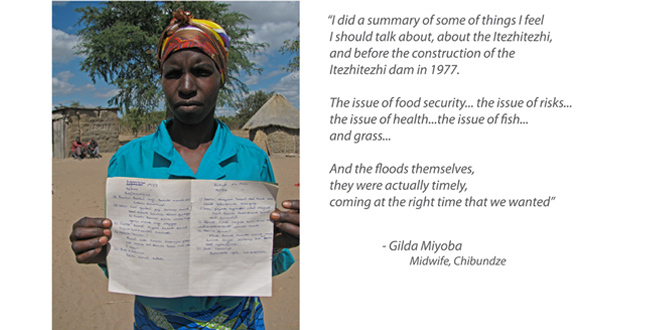 Residents adapt their livelihoods to the changing seasons, climatic patterns and dam operations. This can be both a risk and a strength. Variability and Adaption: Tangible Consequences. 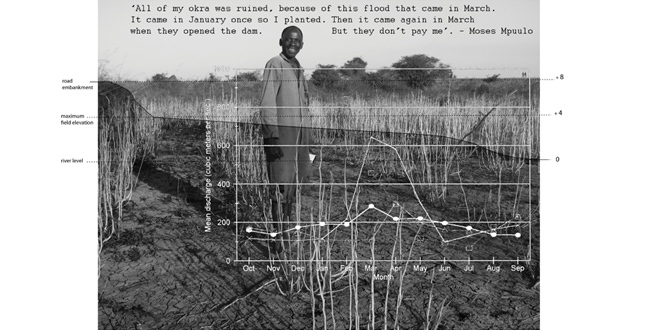 Photovoice makes tangible the experience of living in a dynamic environment, revealing not only reliance on the seasonal productivity of the Flats but also concern at the unpredictability of dam releases and rainfall, which create real consequences for participants’ livelihoods. 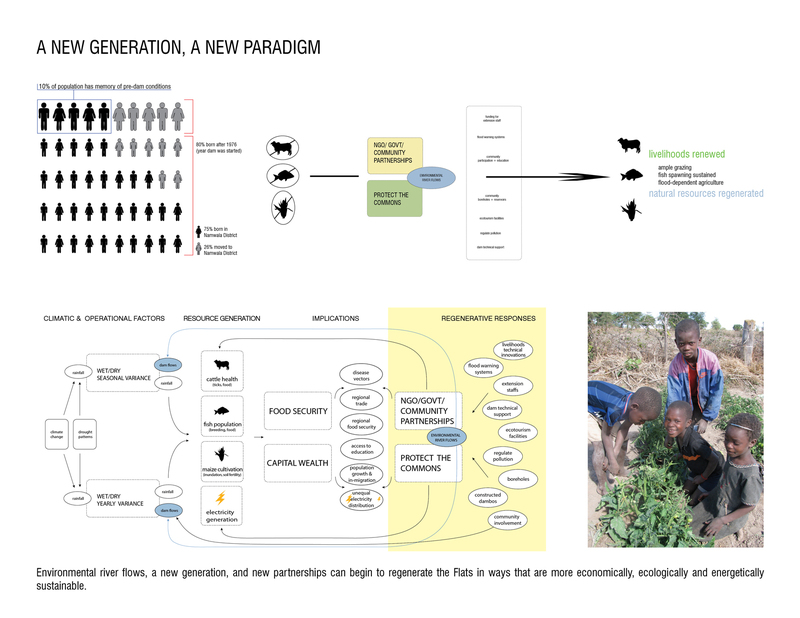 Can Flows of Water, People and Information be Regenerative? Itezhitezhi Dam was designed for managed seasonal flooding to mimic pre-dam flooding patterns but implementation faltered. Today, improved technology and operating procedures can allow riverflows to be managed with more nuance and sensitivity to both ecological and community needs. A New Generation, a New Paradigm. Environmental river flows, a new generation, and new partnerships can begin to regenerate the Flats in ways that are more economically, ecologically and energetically. The daily lives and livelihoods of an estimated 500 million people worldwide are affected by the alteration of river flows downstream of large dams. 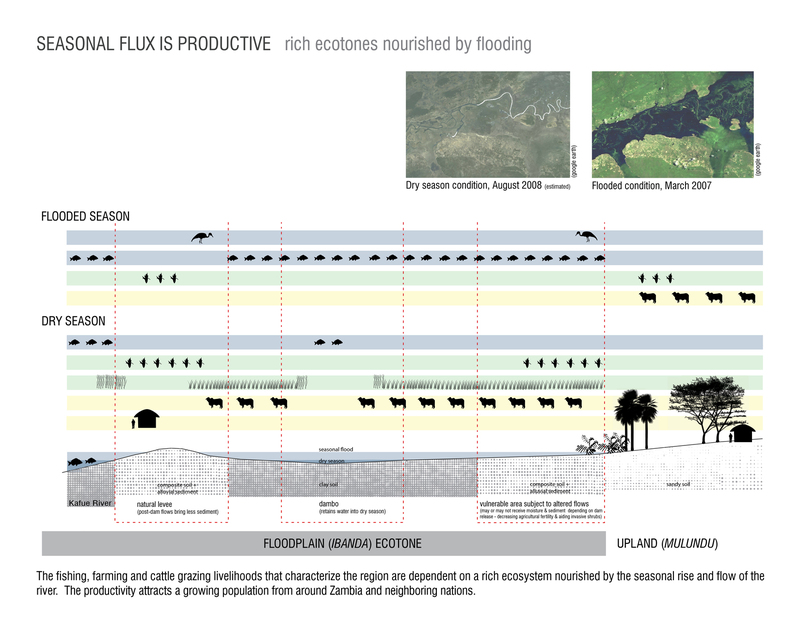 Flood, Flow, Flux is a case study that combines qualitative, context-driven, community participant methodologies with quantitative data to create fresh understandings of the complex ecological, economic and social repercussions of a dam on a dynamic floodplain environment in Zambia. The project begins a re-valuing of the seasonal floods and flood-dependent livelihoods. The fishing, farming and cattle grazing livelihoods that characterize the Kafue Flats of Zambia are dependent on a rich ecosystem nourished by the seasonal flood cycles of the Kafue River. However, the flooding patterns of the Flats are now significantly altered by the Itezhitezhi Dam (constructed 1978) which regulates water flow for the downstream Kafue Gorge Dam (constructed 1972), a hydroelectric generator for most of the nation. Seasonal flooding is now often unpredictable in its timing and duration. Vegetation and wildlife patterns have changed dramatically and flood-dependent livelihoods are threatened. A new focus on the impacts of dams on downstream human settlements is being pursued by The Nature Conservancy, World Wildlife Fund and other organizations concerned with restoring environmentally beneficial river flows in several key watersheds, including the Zambezi. They have given the Kafue Flats particular attention because of its high habitat value and productivity, and strategic location between two dams on the Kafue River, a tributary of the Zambezi. Several large floods and unscheduled releases have resulted in widespread destruction of crops, livestock and homes, while drought years and dam operating procedures have led to widespread ecological changes. However, the ways in which a dam can cause subtler impacts on downstream economic and social patterns has been only secondarily documented in the region (with exception of Beilfuss, 2002 on the Zambezi), as scientists have focused on quantitative hydrological and ecological measures. 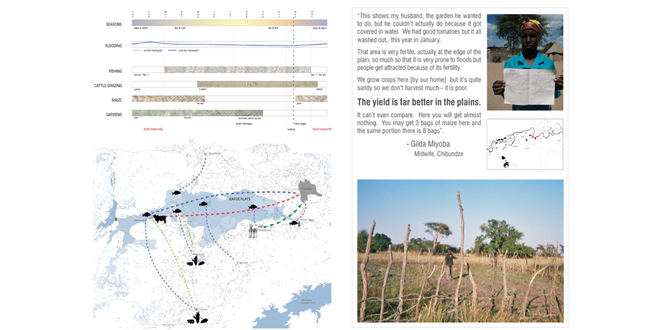 Flood, Flow, Flux focused on fine-grained, qualitative observations about the relationship of communities to the seasonal fluctuations of the river that could be used in concert with a wider array of environmental and social science data to form a case study useful in implementing environmental flows on the Kafue and elsewhere. 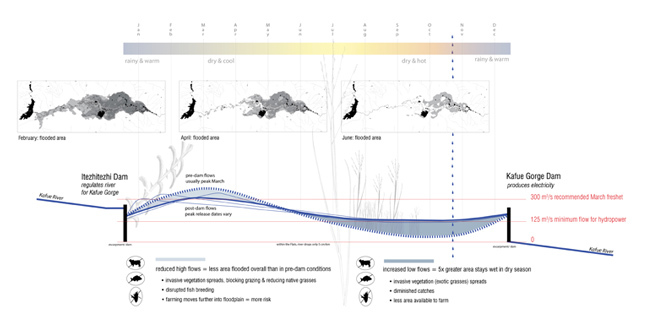 Key to the research is the Photovoice methodology, which elicits community members own voices and photographic vision to directly communicate concerns about a given issue, in this case their relationship to the altered floodplain ecosystem. What emerges most clearly is that ecological changes wrought by the dam manifest as real consequences for project participants’ livelihoods and the development of the Flats’ towns and villages. This project expands the discourse about dam management, environmental river flows, and the consequences of hydropower projects. It also enhances the role of landscape architects in addressing issues of economy, ecology and energy within the context of international development and conservation. 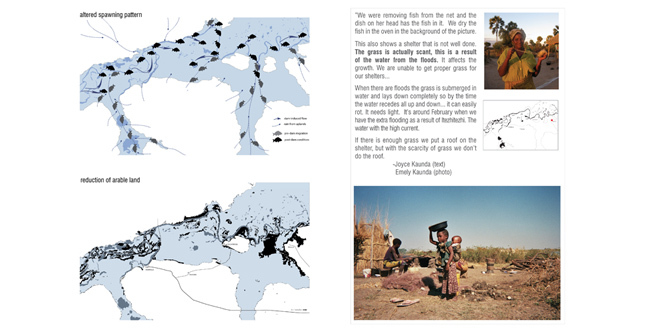 I used Photovoice and spatial fieldwork methods during two months (summer 2009) in the Kafue Flats. This was preceded by research on the impacts of dams in Africa, and followed by analysis of available data for the region. An essential component of the research was the Photovoice process (Cunningham et al., 2009), in which community members took photos of what they think is important about a given issue, and then had a lengthy interview about the context and motivation in taking each picture. I worked with 19 participants from Maala and Baambwe villages in Namwala District, including both men and women involved in the primary fishing, cattle and garden-oriented livelihoods. A translator and I met with participants in small groups, explaining that the aim of the project was to give them the opportunity to show outsiders how they used the floodplain for their livelihood and the flooding patterns (seasonal and dam-induced) affected their health, access and education (whether positively or negatively). The participants, many using a camera for the first time, took pictures for a week before cameras were collected and developed in Lusaka. The translator and I then went to each participant’s home for a recorded interview. These interviews were extensive conversations, usually attended by neighbors and family, and followed by walks to map locations found in the photos. Photovoice as a methodology has several strengths. Participants are empowered by being approached as experts in their community who can share their knowledge and concerns with a larger audience. The process is collaborative and not highly controlled by the researcher, allowing the participant’s true ideas about an issue to surface. It generates a ripple effect as the participant often explains the project to others as s/he is taking photos. Many went out of their way to show their neighbors’ conditions as well as their own, or to photograph places or situations they knew I could otherwise not access. Going through each photo led to a wealth of details about everyday life, cultural assumptions, and physical locales. The process unfolded over six weeks, so I could see water conditions change over time and meet with participants multiple times. Each of these factors increased the breadth and depth of the research over a standard interview. The Photovoice process was supplemented by interviews with community members including traditional chiefs, municipal executives, elders, community garden groups, and leaders of civic associations. A spatial dimension to the research was pursued through recording walk sequences, hand sketches and maps, and GPS mapping, which were done both alone and with Photovoice participants at their specified locations. Spatializing and making visual existing ecological, hydrological and social science data is critical to making the research more than an aggregation of facts. Together, the place-based interviews and data create a new understanding of a cultural landscape that is shaped by multiple physical and social forces. 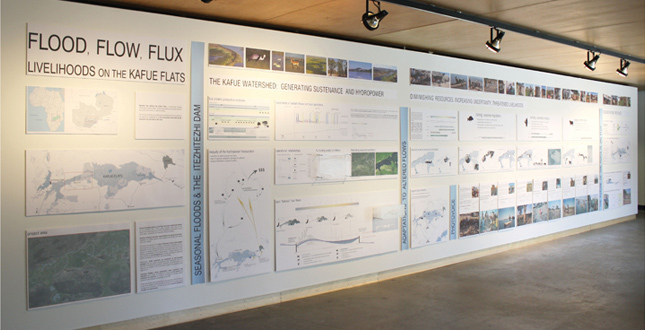 This project is situated within a small but growing body of literature and practice about the downstream impacts of large dams on human settlements, as opposed to consequences of upstream reservoir relocation issues, and in addition to quantitative studies that focus solely on hydrological issues. This literature includes articles produced for the 2000 World Commission on Dams (Acreman, 2000; A. Adams, 2000) and others that focus on dammed African floodplains (W.M. Adams, 1985; Emerton, 1994; Schuyt, 2005; Turpie, 2005; Zwarts et al., 2005), or “environmental flows” in rivers (Dyson et al., 2003; Postel and Richter, 2003). 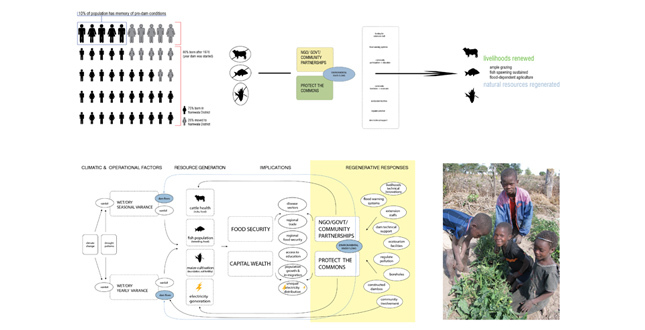 These articles established ways of thinking about flood-dependent agriculture, fisheries and trade networks, and the unintended consequences of changing river flows on livelihoods and settlement patterns. In addition, the work is informed by conceptions of ecosystems, infrastructure and settlements as dynamic and complex interconnected networks (Corner 2006; Mathur and da Cunha 2009; Yu 2009). The temporality of the rains and river flow shapes everyday life in the Flats just as it does in Mumbai or New Orleans. 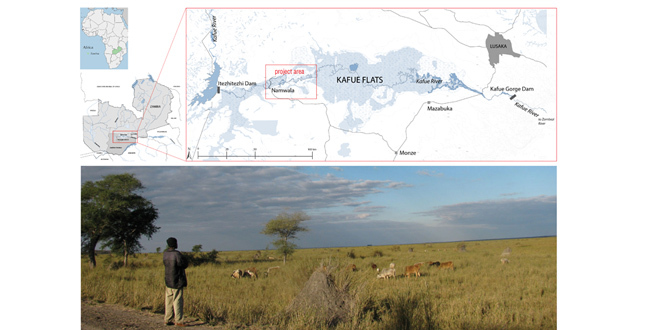 Literature specifically on the Kafue Flats includes pre-dam studies (Sheppe 1971, 1978), government and NGO reports (WorldFish Forum, 2004; Strategy for Flood Management, 2007; Glystra et al., 2008), anthropology studies (Haller and Merten, 2008), ecological surveys (Ramsar Designation, 2007), and a report on efforts to introduce environmental flows (Schelle and Pittock, 2005). Findings from these articles were integrated with Photovoice observations to create a more complete picture of how Itezhitezhi dam affects livelihoods in the project area. Specific dam impacts include changes in floodplain vegetation, population decline of an endemic antelope and other key species, decreased cattle health, reduction in fisheries, and reduction in floodplain agriculture. 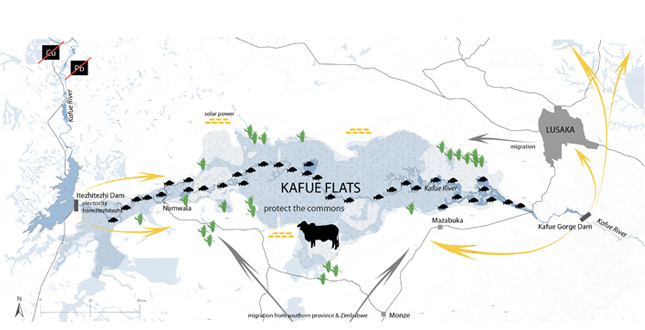 These impacts threaten the economic and food security of the Kafue Flats. The seasonally-flooded grasslands and mopane woodland are encroached by termite mounds and an invasive shrub because of dry conditions from drought and minimum dam flow requirements through much of the 1980’s and 1990’s. Grass species and composition changed, with less grazing grass and roof-thatching grass being available. While these impacts are mentioned in published sources, the Photovoice participants corroborated them with visceral pictures and current personal, place-specific details that connected health and economic impacts to those ecological changes. Participants revealed dependence on the seasonal fluctuations of the river but also concern about environmental changes brought by the dam and anxiety over the unpredictability of dam-induced floods. The participants’ high level of familiarity and concern about these impacts indicates the wide scope and real economic and social consequences of the dam-induced environmental changes. Increased dialogue among stakeholders about responsive dam operations and a range of strategies for increasing food security and protecting the commons are critical to regenerating the Flats. Adjudicating common resources will also be increasingly important. Currently most of the floodplain in considered a common resource, held by local chiefs, but privatization of land is growing. In addition, the Flats are threatened by heavy metal pollution from the upstream Copperbelt industries, as well as increasing water abstraction. The floodplain itself, a zone of vulnerability but also great natural wealth, will become an even greater source of uncertainty for local residents’ livelihoods and regional trade networks if its role as a common resource is further threatened. 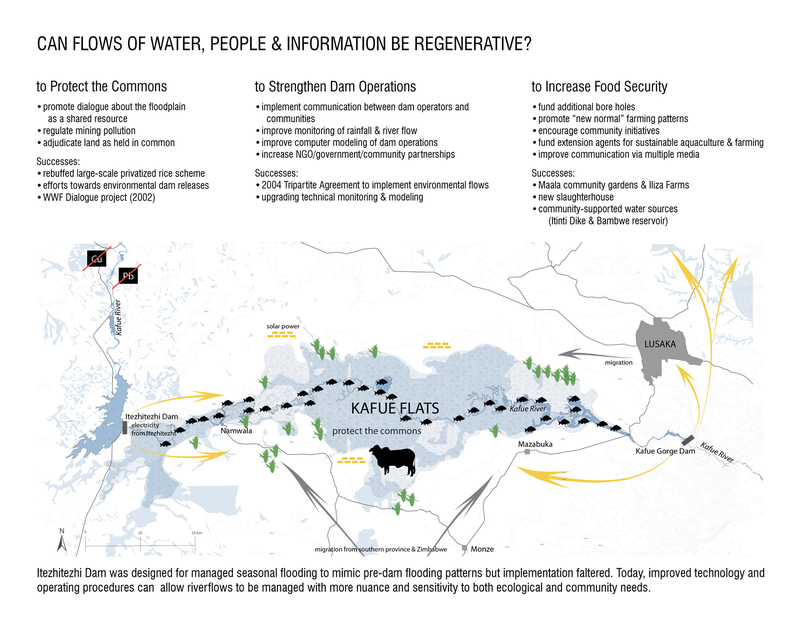 This project re-conceptualizes the Kafue Flats as a dynamic system, one in which environmental river flows, new partnerships and re-valued resources can sustain healthy communities. Increasingly, stable economies are predicated on well-managed ecologies that can support development within reasonable bounds. If the Kafue Flats becomes overgrazed, overfished and overdeveloped, or if flows are not restored, it will not be able to support the populations who depend on it. However, if the natural flux of the Flats can be restored through more sustainable dam operations, it can continue to be a wealth of natural resources such as grazing and thatching grass, fish, and fertile soils. This research, particularly the Photovoice process, also re-values the Flats as more than a resource for hydropower, irrigation water, or endangered species habitat. Photovoice participants asserted their knowledge about the floodplain cycles and resources, recalling and enriching their own and their neighbors’ understanding of the value of those resources. By understanding the Flats as a rich cultural landscape in which livelihoods are closely intertwined with a specific environment, both the people and the place can begin to be valued more highly. 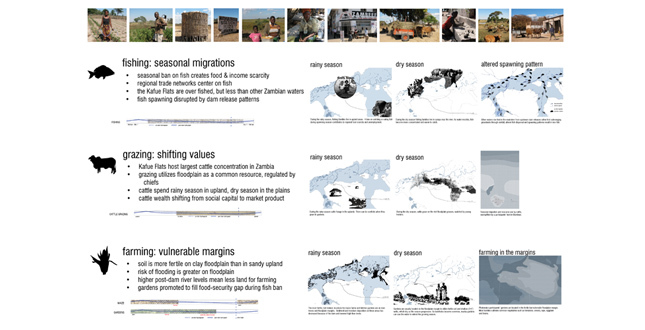 This project highlights the continual need for close-grained, contextualized case studies that illuminate the complexities and ambiguities of larger issues such as hydropower production, river management, or small-scale agricultural production methods. The Photovoice methodology allows a level of correlation between observation and quantitative studies, but could be augmented by more rigorous social science data. This study is significant because of its impact in engaging participants in the research locale, as well as its ability to contribute to a broader discussion among both academics and development practitioners about dam management, and the value of floodplain economies and ecosystems. Furthermore, it is significant within the discipline of landscape architecture for the expanded field of connections it forges between international development, conservation science and cultural landscape studies. The opportunities for landscape architects to emerge as leaders in the global hunt for sustainable and equitable water, energy and land strategies makes it imperative that students undertake this type of research and share their findings with colleagues and the public. The public realm in which we work may include landscapes far removed geographically, but always tied to globally contingent needs and desires. 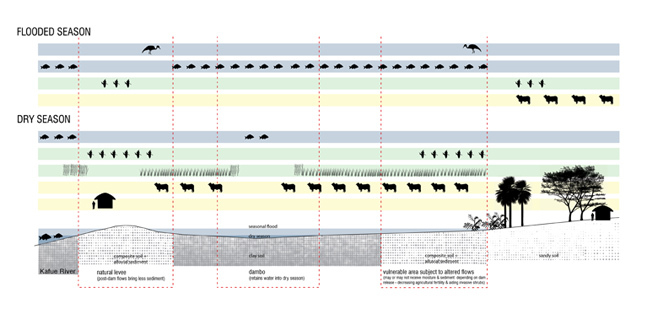 Recognizing an expanded scope of landscape architecture, and the discipline’s ability to holistically consider issues of ecology, development and history within a specific physical location, are critical facets of the project. In Bambwe: His Royal Highness Chief Mukobela Wesley Shabongwe, Mwapabwe Mpuulu, Oliver Ndombe, Kingsley Shindu, Molivia Muzandu, Judith Mayonda, Patrick Kabali, Veronica Mutafela, Gilda Miyoba, Steven Lowa. In Maala: His Royal Highness Chief Mungaila Mr. Waterford Kasenga, Gift Namashoba, Sandra Namashoba, Harrison Mwanza, Ida Zimba Mwanza, Everina Namashoba; Brenda Shayawa; Brenda Kasokola; Daphin Chikole, Hilda Shimbondu, Sinody Kasanga, Castellah Kaunda, Regina Lengwe, Emely Kaunda, Joyce, Rafael Zani.